Milbocker & Sons, Inc. experienced site prep experts have the equipment and knowledge to get your project off to a solid start — and finish on schedule. We have handled major earthwork jobs from contouring to major interchange networks, the site prep contractors and excavators at Milbocker & Sons, Inc. have the experience and responsiveness you need to complete your next project on time and on budget. No matter what environment exists for your next site preparation or excavation project, we will get the job done quickly, efficiently and with minimal disruption to the surrounding environment. Even on steep slopes, we'll do our level best to get site work done to the each customer's demanding specifications. The experienced excavators at Milbocker & Sons, Inc. specialize in a wide range of excavation work, including landscape grading, tree and brush clearing, drainage ditches and tiles and all new construction excavation. 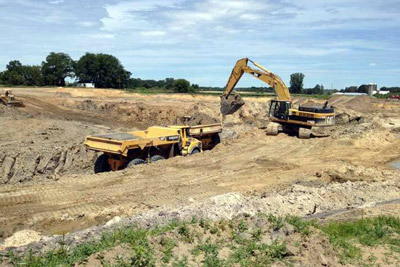 To learn more about Milbocker & Sons, Inc. professional site prep and excavation services for your next Michigan project, or to request a quote, contact us here or call us directly at (269) 673-2195.